Lovejoy ISD refused to send an Election notification postcard to those who do not have children in the district, and would have their taxes raised. LISD only notified parents, and sent a mailer to those over 65 telling them their taxes would not increase if the 2 cent tax increase passed. Yet just one week AFTER the election, Lovejoy ISD pays to send out a glossy mailer to EVERY resident about the district and to raise money. Mr. Moore expected the public to notify their neighbors that there was an election. The superintendent of a district making a six figure salary, is paid very well to communicate with the community. Early election, residents who were not notified were unaware of the election and the results show it. As residents notified their neighbors, it is clear from Election Day voting results - 131 AGAINST to 81 FOR - a tax increase, that Lovejoy ISD's strategy of only notifying select voter groups did work. But it is NOT ethical, not in keeping with American values, and violated the spirit of Election laws. Please document the steps you have taken to notify ALL the voting public concerning the tax ratification election, especially taxpayers who are under-65 and do not have children attending Lovejoy ISD. In the absence of a community newspaper that has a large distribution within Lovejoy ISD, we rely on Email Express as our primary communication tool. In order to give every taxpayer the opportunity to access this information, we sent out a post card in August offering Email Express as a source of communication about district happenings. In addition to giving folks the option to subscribe online, we also gave them a phone number to call if that option would not work for them. It has come to my attention that not one of my neighbors (with no children attending LISD), knows about this election which, if ratified, will raise their taxes 2 cents. Because they do not have children in Lovejoy ISD they are not interested in signing up for an Email Express. The dissemination of information concerning this election has not been equitable. 4) The opportunity to early vote on campuses coinciding with heavily promoted Ice Cream Socials and Friday Night Football. 65 & Older residents received a mailer stating that their taxes would not go up. 65 & Under residents with no children in the district, received no mailer and no notification of this election and their taxes WILL go up. It appears that Lovejoy ISD is intentionally trying to hide a tax election from the voting public that is most likely to vote against a 2 cent tax increase. I realize that you and most of your administration are not taxpayers in this district, but I believe in the interest of being fair to all taxpayers you should send out a postcard notifying those under-65 without children in the district that there is an election that will increase their taxes by 2 cents. Thank you for your suggestion. We will consider it as we continue to determine the most efficient and cost effective manner to inform the public regarding district business. The campus version of Email Express are certainly aimed at the parents who have children in the school, but the district Email Express is certainly relevant for every taxpayer who want to stay informed about district business. I hope the district will quickly decide to do the honest and ethical thing by sending a postcard to ALL residents notifying them that there is an election which will raise their taxes. If Lovejoy ISD can afford to send a mailer to those over-65 notifying them that their taxes WON’T increase, then Lovejoy ISD can afford to send a mailer to residents under-65 who do not have children in the district to notify them that there is an election that WILL increase their taxes. I have received 4-5 brochures and newspapers from Lovejoy ISD in the mail this year, as I am sure every resident did. 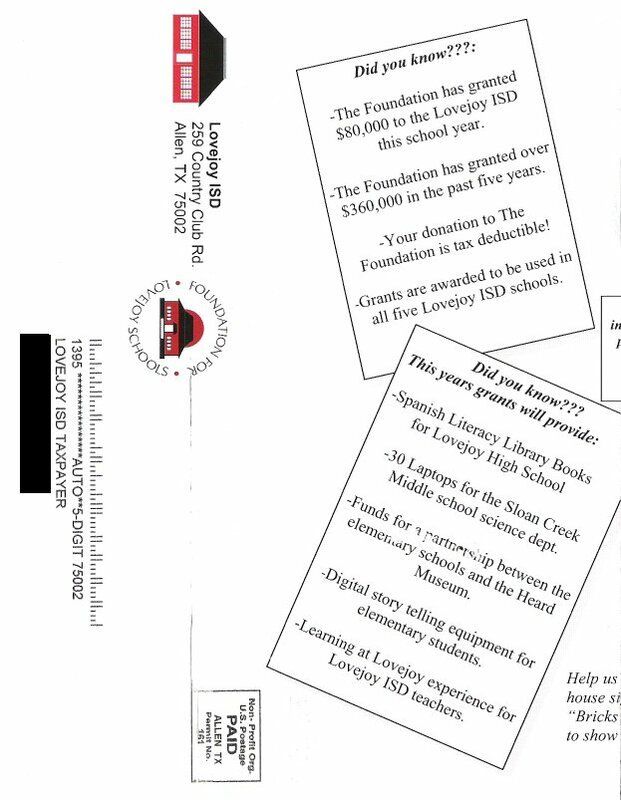 If Lovejoy ISD needs to cut postage costs, please do not send school newspapers next year in lieu of notifying residents that there is an election which will increase their taxes. This is an administrative task and should not require a school board vote. However, I did notice that last Thursday the school board called an 8am meeting on short notice. If school board approval is needed, please call a meeting today so this can be approved in time for residents to vote on whether or not they want to pay more taxes. The only mailer that has come out of central administration so far this year has been the post card that went to all taxpayers who do not have children in school and we also culled out those taxpayers who we could verify were receiving Email Express. I will review what the campuses are sending to all taxpayers. If the campuses do send a newspaper to all addresses, this could be a future solution by having the students write an article from a journalistic perspective on district business. The board has approved this proposed 2 cent tax increase as part of the budget process, but as you know HB 1 calls for voter ratification for any increase in the M&O tax rate. Thank you again for your response and patience. I have a copy of several Lovejoy newspapers that were sent to my home, plus glossy brochures from the Foundation for Lovejoy schools that I would be glad to share with you. Are you telling me that the campuses send out newspapers at great expense without authorization from district administrators? In these tough economic times, I hope LISD administration will rectify this expenditure immediately, especially when LISD cannot afford to mail election notification postcards to taxpayers about a 2 cent tax rate increase election! As you have stated earlier, there is no newspaper to cover LISD, so the only way residents would know about this election is through communication from the school. A future solution will not solve an immediate problem that could easily be handled with a postcard to under-65 residents who do not have children in the school. It appears they are the only residents that Lovejoy ISD has left out of the loop. Initially, Lovejoy ISD may have inadvertently not notified these residents. But now it has been brought to Lovejoy ISD administration attention. If Lovejoy ISD decides not to send a postcard to these residents, it shows clear intent to keep a calculated sector of taxpayers uninformed and away from the polls. Voting is an American right protected by the Fifteenth Amendment. By handpicking which Lovejoy ISD residents are notified, LISD is undermining the essence of the Fifteenth Amendment. I once again respectfully request that the LISD administration immediately notify ALL voters that there is a 2 cent tax ratification election. These are the same taxpayers that will be paying the bill. Don’t you believe that ALL taxpayers should be notified equitably, especially those who will bear the tax burden? For questions or assistance, please contact Cindy Booker at 469-742-8003." Please encourage your neighbors to sign up for Email Express not because they have children, but because of the bulleted points above. The email that was forwarded to me referred to the TRE as “LISD Secret Tax Increase Election”. I would ask you to be the judge to determine if the district has conspired to somehow keep this public election as secret.  Lovejoy ISD has not raised the I&S tax rate since the 2007 bond election as promised. During the 2007 bond issue, the district communicated information from our financial advisors that projected that the bond issue would cause a one time 3.5 cent increase in the I&S rate based on a conservative estimate of property value growth. To date, this has been accurate even with the slow down in the economy; the I&S rate again remained stable with no increase from last year and we have no data to suggest that an increase will be necessary next year. The email that was forwarded to me stated that “next year taxes will go up again to cover bond issuance.” The district has no information nor does our financial advisor to support this statement as accurate. 1. The Tax Ratification Election (TRE) will allow the voters of LISD to ratify the M&O tax rate of $1.06 (increase of 2 cents) approved by the Board of Trustees in August. This rate is required to fund the budget that was approved. 3. If the TRE is not ratified, the district will cut expenditures totaling $420,000 from this year’s budget. The items cut will include two new school buses and classroom technology for each campus. The election is tomorrow. Please study the information and exercise your right to vote. If you have specific questions, please email me or you are welcome to call me on my cell at 972-415-8129. As you know, today was the Election Day for the Tax Ratification Election (TRE). This election was set to give you an opportunity to ratify the tax rate for the 2009-2010 school year; the total projected tax rate is $1.535 which includes a 2 cent tax increase which will yield an additional $420,000 for school operations. The district intends to spend that money on school buses and classroom technology.